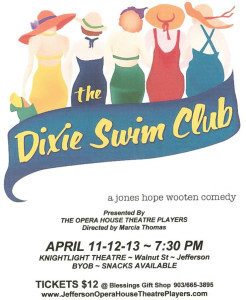 Jefferson Texas’ Opera House Theatre Players is performing the play “The Dixie Swim Club” by the play writing team of Jones, Hope and Wooten. The performances will be in the KnightLight Theater on Walnut Street in Jefferson. There will be refreshments and you can BYOB, set ups are provided for a small fee. The play centers around the lives and friendships of five Southern women who met in college on the swim team. Every August for a long weekend all five get together to re-energize their friendship. Each year they stay in the same beach cottage on the Outer Banks in North Carolina. The ladies do this every year for more than thirty years; they rely on each other, share the joys and hardships of life and endure over those years. The Dixie Swim Club performances are directed by Marsh Thomas, showing at the KnightLight Theater at 202 N. Walnut St. in Jefferson Texas. The show starts at 7:30PM each night. Tickets are on sale now for $12 per person, you can pick yours up at Blessings Gift Shop on Polk St. or purchase them online at the Opera House Theatre Players site. While you are at their site be sure to check out their upcoming plays as well.